Watching the funeral of President George H.W. Bush is something I wish all Americans could have watched. It was one of the most moving services I have seen to date. 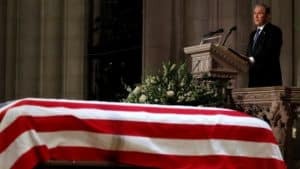 Listed below are five key points from the funeral of our 41st President I hope others will take to heart. A Statesman is still a man—Listening to the son of our 41st President speak about his father and late mother was an incredibly moving eulogy. He spoke about his father’s adventures in World War II, his escape from death on two separate occasions, his true love for his bride, and his daily prayers for his daughter, Robin, who died at the age of three. George W Bush stood firm behind the podium and spoke with a smile of pride. But in the end, like most son’s speaking about their late fathers whom they cherished more than life, he broke down showing the world that he is no different then the rest of us full of love, happiness, anger, and sadness. Have Two Gears in Life: Full Throttle and Sleep – When a man escapes death, he has an entirely new outlook on life. When a man escapes death more than once, he ensures to live it to the fullest knowing how quick everything could be over. George H. W. Bush definitely lived life to the fullest. From parachuting out of an airplane with the Golden Nights on his 90th birthday to speeding in his boat seeing if he could outrun his Secret Service Detail just for the laugh, that was our 41st President. Hopefully it is a reminder to all of us to simply, Seize the Day. If you ask God “why didn’t you take me,” remember it is because He wants you to do so much more in life—Many veterans live lives full of grief and are found often wondering why they made it home when many of their brothers-in-arms had not. It’s quite simple even though it may be hard to accept—simply put, God has plans for you. Learn not to fight what God has in mind but rather learn to allow him to guide you through the journey. Pray for others, but more importantly, pray WITH others—It’s easy to stop and ask how someone is doing, but it is difficult to stop and listen to them spill their hearts. Pray for these people. But ask them if they would be willing to pray alongside you. Without sounding too cliché, the Navy SEAL motto “One is none, two is one” actually makes sense—especially when it comes to prayer. Rub the Feet of a Friend in Need—President George H. W. Bush’s Chief of Staff, James Baker, stood by the feet of his longtime friend all the way till the very end. This statement is not said just figuratively but literally. The day our 41st President passed, we learned during the eulogy of James Baker physically rubbing the feet of his friend. As this was told to the millions viewing the funeral service, we were reminded of Jesus washing the feet of his disciples. What James Baker did was the epitome of what our Lord Jesus Christ seeks from us—humility and love. If only we were all like James Baker in his devotion and loyalty to the man whom he loved dearly. George H. W. Bush was a vibrant man. And today, if for just one moment, we can learn so much about who we are as a people and the work we need to do to better not just ourselves, but our very community in the world in which we live. If we simply just take the time to embrace just a few key points which he has left us with to make this a kinder and gentler world.